It has enough power to play modern games at High settings (at 1080p). The “C” in C730 stands for “Cube.” That’s all you really need to know about Lenovo’s C730 Cube mini-PC. It’s tiny, it’s boxy, and sort of adorable. It’s also surprisingly powerful, at least coming from Lenovo—a company I don’t typically expect to put out great gaming PCs. Lenovo’s made a push these past few years though, first in laptops and now desktops. The goal: Mainstream gaming hardware at a mainstream (read: affordable) price point. The C730 isn’t necessarily the “most” anything—not the most powerful, nor the most compact, nor the most elegant. But it’s enough of each to make it worth a second look, especially for space- and budget-conscious shoppers. 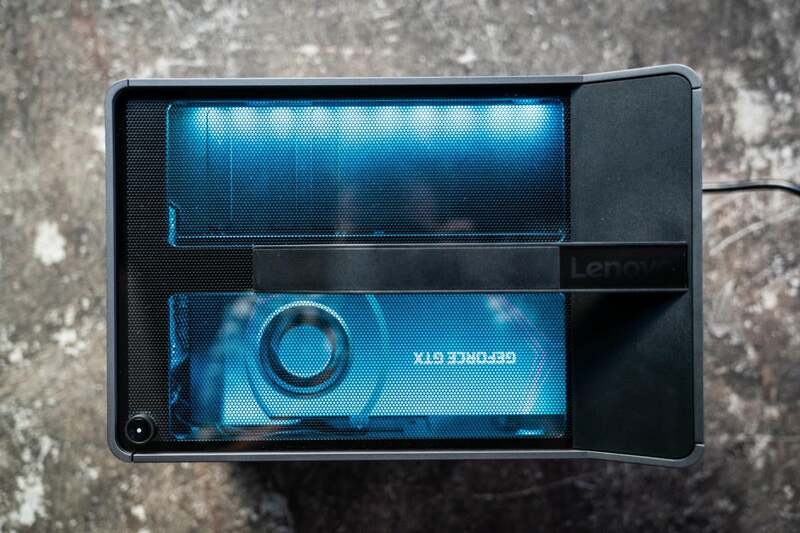 The Lenovo C730 Cube’s distinctive front panel sports an array of circular ventilation holes on the grille. The C730 Cube isn’t as tiny as some of its console-esque brethren, like the MSI Trident 3 or the Asus ROG GR8. Measuring 9 inches tall, 9 inches wide, and 13 inches deep, however, it’s still a far cry from a tower. It’s pretty damned portable as well, coming in under 20 pounds. Did I mention there’s a handle? It’s the second feature you notice, after the diminutive size. 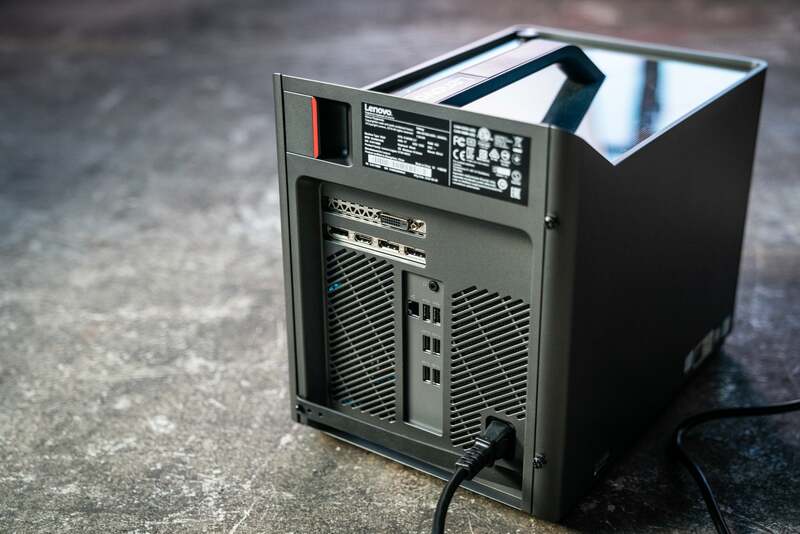 Many other gaming PCs sport a handle, of course, but the C730 Cube is one of the few small enough for a handle to make sense. At E3 I joked that the C730 was “like the GameCube,” primarily because of the handle. The more I’ve thought about it, the more I like the comparison to Nintendo’s old console. It’s fitting. As is so often the case with Nintendo, the GameCube deviated from established console norms of the time to create a console with mainstream appeal. I get the same vibe from Lenovo here. Design is subjective, of course, but it has more flair than your standard enterprise-focused desktop, without leaning hard into the gaming aesthetic either. The front panel’s circular grille pattern is unique and far more friendly than the hard edges we’d typically see in gaming pre-builts. You can enjoy the RGB lighting through the top panel of the Lenovo Legion C730 Cube. So yeah, in broad swathes I love the look of the C730. I’m even a fan of the logo, which is good because it takes up a large percentage of the front panel. Lenovo wisely keeps its own branding understated, allowing the “Legion” sub-brand to dominate the design. It’s a pretty generic name, but I like the typeface used here, as well as the backlit starburst design on the O, which gives it almost a 60’s retro-futurist, space-station look. The all-but-mandatory RGB lighting touches are also well done. You get the barest hint of light through the circular openings on the front panel, plus a few highlights on the back. The sides are opaque, and the primary lighting zone is actually the top—a translucent panel that shows off the C730’s interior lighting as well as the GPU. It’s a bit flashy for living room use perhaps, an accusation I’ve also leveled at the MSI Trident in the past. But by angling the lighting upward instead of outward, it at least prevents the C730 from blinding you in a dark room—plus, the case is short enough you can actually take a peek inside. The small collection of ports on the bottom of the front panel are frustratingly difficult to access. I do have a few sticking points. The front I/O is crammed in at the bottom of the case, which is a terrible decision. Either you confine the C730 Cube to desktop use, or you’re never going to use those front ports. There’s no way you’re going to run wires all the way to these ports if the PC is on the floor, especially headphones and microphone cables. Even more bizarre: The two USB-A ports are upside-down, and given only a half-inch or so of clearance. I couldn’t even manage to fit a handful of USB sticks I had lying around, which is awfully inconvenient for front panel connections. There’s also a rubber cable wrangler on the rear. This one’s less actively annoying, more just pointless. It sits right at the bottom of the rear I/O, which implies you’re supposed to run cables out the back and...down? Even if you perch the C730 Cube on a desk, it doesn’t make much sense to run the cables underneath the rubber strap and then back up to your peripherals, and if you intend to sit the C730 on a floor it’s an even more useless feature. I’d also be remiss if I didn’t mention the dismal number of ports on the C730. It’s a full-size graphics card, which at least means a full complement of DVI-D, HDMI, and three DisplayPort jacks. Aside from that however, the rear panel features only a dual headphones/microphone 3.5mm port (as opposed to the split 3.5mm ports on the front), ethernet, four USB 3.1, and two USB 2.0 ports. 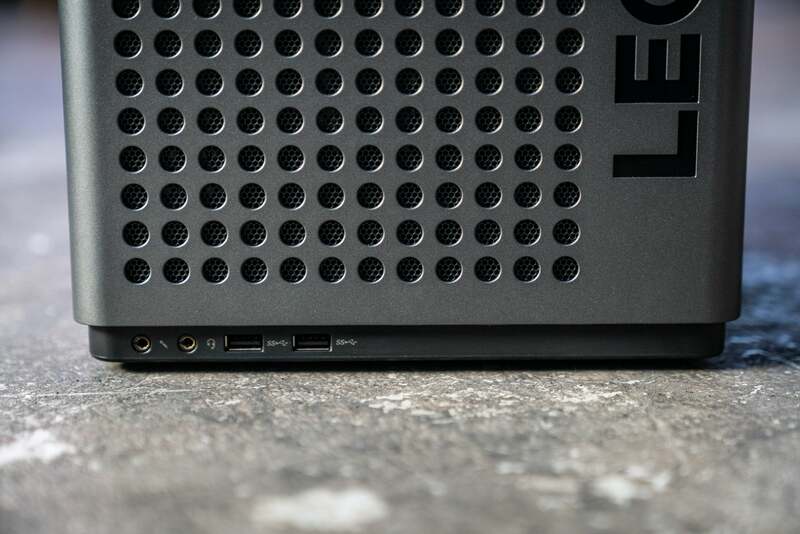 The Lenovo C730 Cube’s rear panel has fewer ports than we’d like to see on a gaming PC. In this day and age, and especially as a gamer, eight USB ports is surprisingly not that many—especially if you happen to own an Oculus Rift, which will cannibalize 3 or 4 of those ports on its own. I have 14 on my daily PC and have had to juggle USB slots before, between my headset, mouse, keyboard, speakers, audio interface, VR headset, and et cetera. Maybe it’s not a problem for you. Or maybe you can minimize the problem with a USB hub—although keep in mind USB slots are all fed through a handful of USB buses, so adding more ports might still cause conflicts if you have a lot of information-heavy devices (i.e. VR headsets, which take up a lot of USB bandwidth). The C730 Cube is actually the pricier of Lenovo’s two cube-shaped models. There’s a C530 below it, which in many respects is the same box—except it ships sans RGB lighting, and with lower specs. That’s a solid mid-tier gaming desktop, with performance to match. At list price, I’d say it’s a bit more expensive than I’d like. Before the MSI Trident 3 disappeared from Amazon it sold for around $1,200—and included a GTX 1070, not a GTX 1060, as Lenovo’s done here. But as is so often the case, list price is merely a suggestion. Lenovo itself sells the system we received for about $1,200 (at time of writing). That’s a decent deal, especially in the post-GPU inflation era. You could potentially build your own for cheaper, but you’d probably end up with a larger and less elegant form factor, no RGB lighting, no Wi-Fi or Bluetooth, and still only save $100 or so. The same goes for other pre-built PCs. 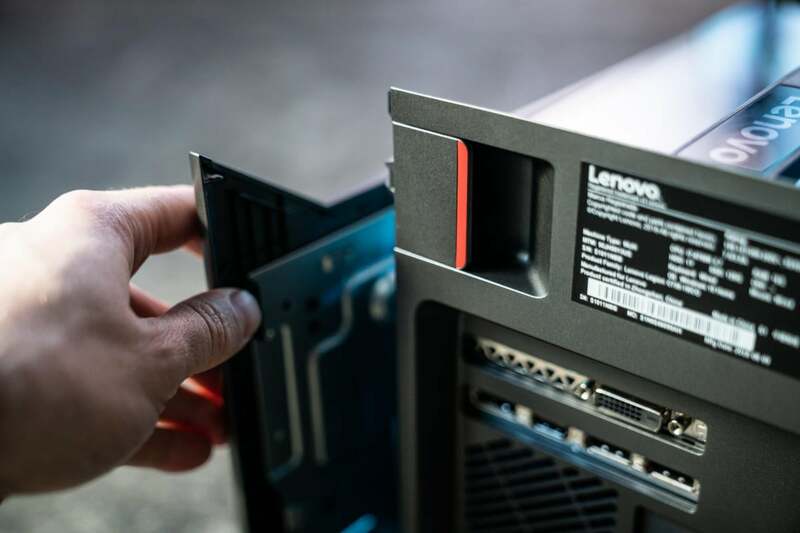 The right panel of the Lenovo C730 Cube releases easily using a rear latch. 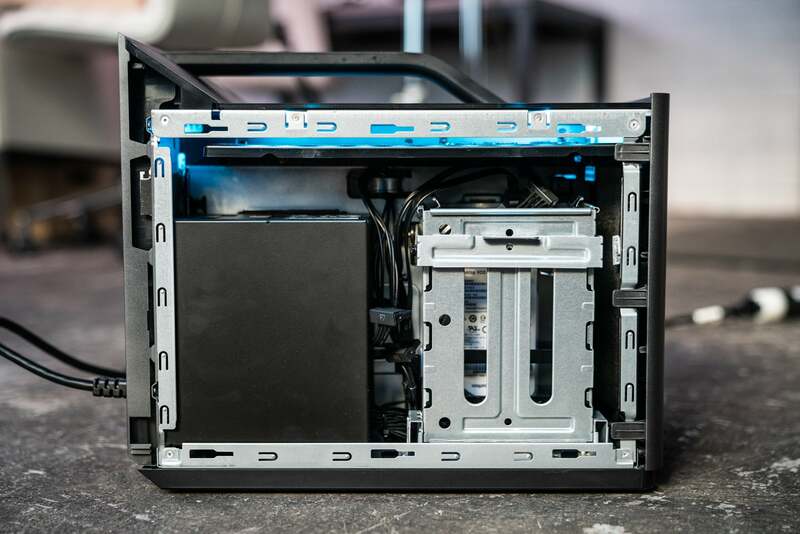 The C730 is also properly upgradable, which isn’t always a guarantee with these bespoke mini-PCs. The interior is easily accessed by pulling a lever on the rear panel, which lets you slide off the right side. That gives you access to the GPU, CPU, and RAM, as well as most of the motherboard cabling. 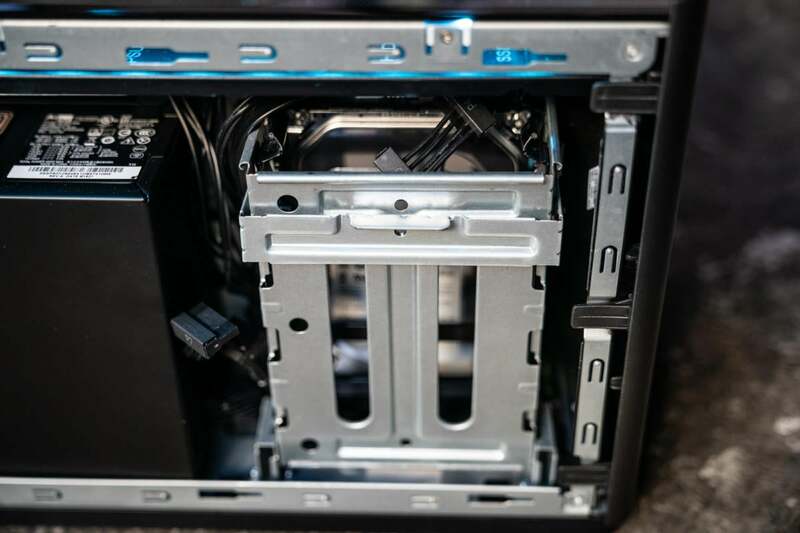 Thumbscrews secure the left panel, which houses the power supply and the hard drive rack. A PC can look good on paper, but what really matters in the end is how it’s all put together. 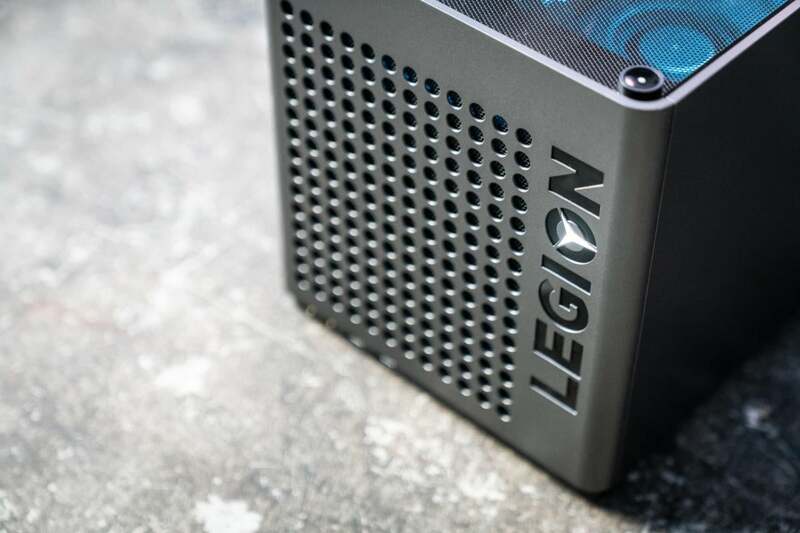 In the case of the Lenovo Legion C730 Cube, there’s some good and some bad. 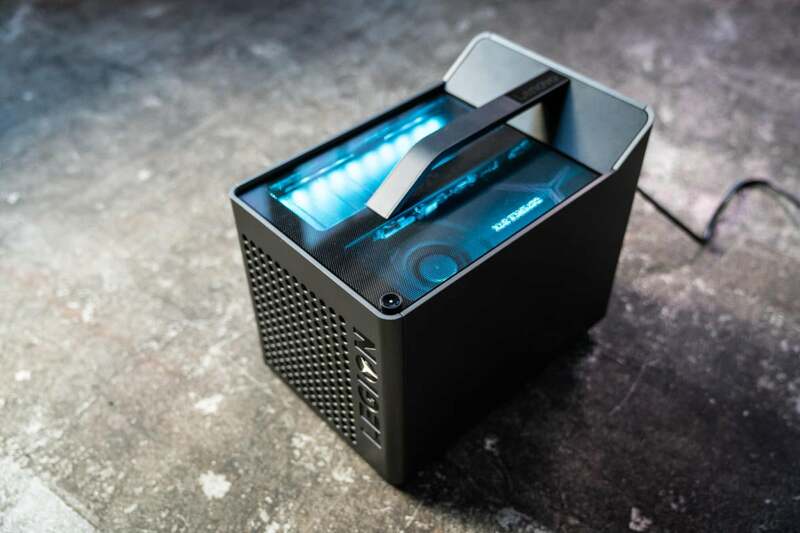 The transparent top panel of the Lenovo Legion C730 Cube shows off RGB lighting and the GPU shroud. First, the good. The C730 uses a full-length (meaning 9.6-inch) GPU, which means you should be set to upgrade to any card in the foreseeable future. Other mini-PCs, like the MSI Trident, use the shorter 6-inch GPUs, which are a bit more limited when it comes to upgrading. It also uses what looks like a standard power supply. That’s fantastic. A lot of these mini-PCs use a custom power solution (like the MSI Trident’s external brick). But if you want more power in your C730? I didn’t dismantle our entire system, but it looks like you could pull out the old 450W supply and replace it with a more powerful one. The Lenovo C730 Cube’s left panel opens to reveal the power supply (left) and drive bays (right). Some caveats: Swapping out the PSU would probably be a huge hassle, and there’s no place on the C730’s case for the standard bottom-facing PSU fan to vent. 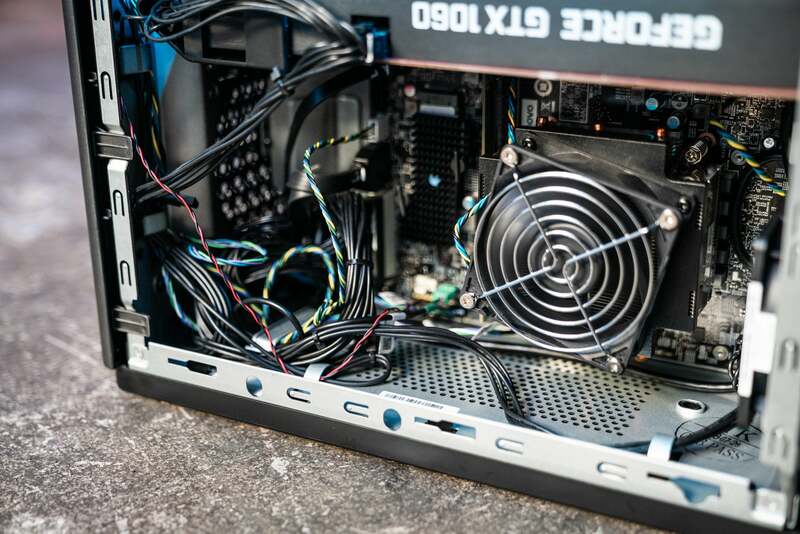 A more powerful PSU usually means more heat, and you might have trouble moving enough air to keep it cool. That said, you’ve got a bit of headroom even if you don’t upgrade the power supply. A 450W PSU is enough to run a Core i7-8700 (or stock 8700K) and a GTX 1070 Ti with some room to spare. In fact, we saw a C730 running a GTX 1070 Ti at E3, though we were told it wasn’t a “certified” setup. Obviously Lenovo didn’t end up selling it. Not sure why, because per the raw numbers it seems perfectly capable. You couldn’t slap a 1080 Ti in the C730 without choking it. But you could probably make a lateral move in a few years to the GTX 1470 or 4070, or whatever 2022’s equivalent might be named. First and foremost, cable management is atrocious. Open up the C730, and it looks a lot uglier than it does on the outside. There are dozens of thin, finicky cables running between all the different parts, with a particularly bad eyesore cluster near the front. And look, I get it: There isn’t much room to hide the cables in this tiny box. Still, it could look tidier. Yes, the Lenovo C730 Cube is cramped for space inside, but the mess of cables still surprised and disappointed us. It also looks like a real pain to upgrade the RAM. There’s no heat-spreader on the single 16GB stick in our system, and I don’t even think the C730 could handle a heat-spreader. The RAM is all-but-touching the CPU cooler on one side. 16GB should be enough for the lifespan of the C730, but it’s still worth noting. There’s not much cooling, as I half-mentioned above. There’s what looks like a single 80mm fan exhaust against the rear panel, with no intake fans of any kind (unless you count the GPU and CPU fans). I said earlier that you could get a Core i7-8700 or 8700K for the same price, the K indicating a processor that can be overclocked. On the one hand you might as well get the K so you have the option to overclock, but on the other? I can’t imagine you could do much, because I suspect even a slight overclock would cause the system to overheat. There are no obvious places to add fans, either, at least without dismantling the whole system. The drive bay carriage in the Lenovo C730 Cube is awkward to deal with: vertically oriented, and complicated to maneuver. Finally, the hard drive rack is awkward to deal with. It’s arrayed vertically, and you pull a lever and sort-of...fold the whole enclosure out of the case. You replace it with a loud clang that startled me the first time. There are hookups for a few additional drives, though it’s probably easiest to swap out the 1TB drive for a much larger drive upon arrival, if you have the foresight. I would’ve liked to see the drive space upgraded across the board, actually. A 128GB SSD is paltry in this day and age, especially with prices as low as they’ve been recently. Gripes aside, I’m still impressed overall. Listen, the Legion C730 Cube isn’t for “Serious PC Gamers” or whatever, that group (and I include myself in this) that’s always chasing smoother frame rates, quieter fans, better textures. But the Steam Hardware Survey indicates the GTX 1060 is the single most popular card among gamers these days, and that more than 50 percent of Steam users run a 1060, a 1060-equivalent, or lower. That makes the C730 a solid option for the mainstream gamer on a budget. It’s got an eye-catching design, a relatively easy path to upgrade, it’s quiet(ish) and inconspicuous(ish), powerful enough to play modern games at High settings (on a 1080p monitor at least), and it does it all for cheap. 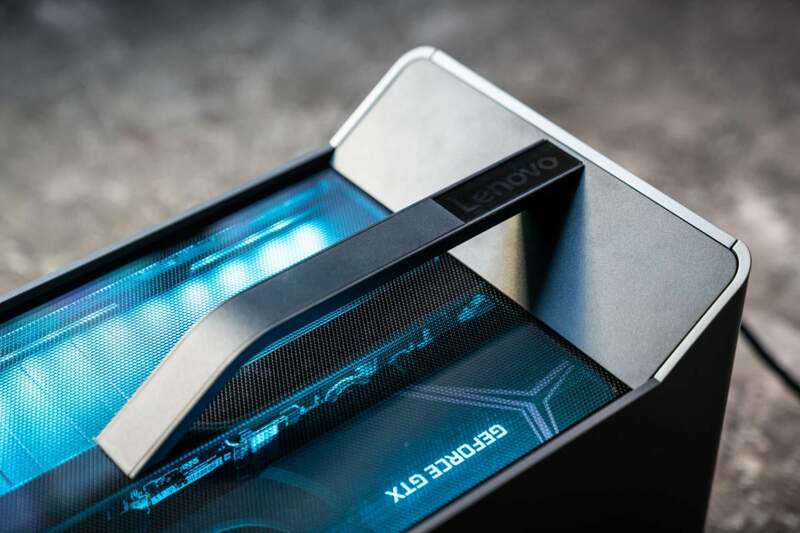 That was enough for Lenovo to make a dent in the gaming laptop market. Maybe it’s enough to make a dent in the gaming desktop market as well.